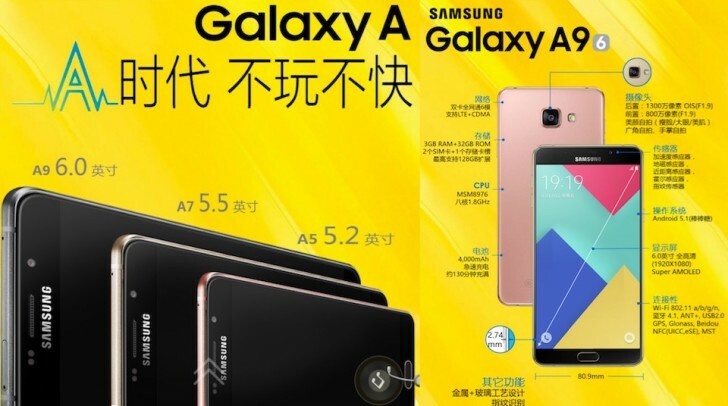 The Samsung Galaxy A9 has been officially announced in China. Hardly anything about it is a surprise by now, as the smartphone has starred in more than its fair share of leaks. The Galaxy A9 sits on top Samsung's premium-built A-series and is positioned right where midrange meets flagship. The design is the newly adopted glass and metal affair, and this 6-incher features a FullHD AMOLED panel. Side bezels are minimal and Samsung is overly specific about their 2.74mm width. The recently renamed Snapdragon 652 (which used to be S620) is in charge of computing, and is paired with ample 3GB of RAM. Internal storage is 32GB and, unlike the company's true flagships, it is expandable. Imaging department is represented by a 13MP primary camera with a wide f/1.9 aperture and optical image stabilization. On the front there's an 8MP snapper behind an equally bright lens. The Galaxy A9 comes with a battery well befitting its display size, and the 4,000mAh capacity can be topped up in a flash thanks to the QuickCharge support. There's a fingerprint sensor inside the home button, complete with Samsung Pay support. The smartphone comes with an extensive connectivity package including Wi-Fi a/b/g/n (but sadly, no ac). Bluetooth is v4.1, there's GPS/Beidou for positioning and NFC too. A minor bummer is that the smartphone launches on Android 5.1 Lollipop, which is halfway out the door already, and certainly not a welcome sight on a newly announced premium handset. Pricing and availability remain to be detailed. this is real smart phone. You can thank global warming for that lol it's only gonna get worse from here on out.